Many of you know that my mom's battle with congestive heart failure began years ago. In fact, she had open heart surgery requiring 5 bypasses seventeen years ago on my daughter, Alyssa's, birthday which is also Valentine's Day. At the time she was very unhappy to be told the bipasses were only guaranteed to last 5-10 years. Eventually she changed her outlook and began to to take on an "I'll show them" attitude...which she did. A few years ago she was informed that she had a heart valve that needed to be replaced. It was again a tough road as she was not strong enough to undergo another open heart surgery. Eventually, after many tests, procedures, and trips to Philly, she was approved for a new procedure to be completed at University of Penn. That was 2 years ago this past February, unbelievably, on Valentine's Day once again. Mom redefined "heart day" for us! Unfortunately her new valve wasn't able to seal correctly and the years since have been an up and down of heart failure symptoms. "11... for I have learned to be content whatever the circumstances. 12 I know what it is to be in need, and I know what it is to have plenty. I have learned the secret of being content in any and every situation, whether well fed or hungry, whether living in plenty or in want." My mom was born in 1930, meaning she grew up during the Great Depression. And while her frugal ways of saving and reusing baggies, aluminum foil, and plastic-ware may suggest otherwise, she has told me that she was a lucky one during that time for having grown up on a chicken farm she never went without food on the table. When her family took things to market in the city they saw people who knew what it was to be in want. I know without a doubt there was a different kind of struggle that went on during her childhood....but she was very reluctant to discuss having a mother who was sick or the loss of each of her brothers. Rather she told us stories of car trips with favorite aunts and uncles and how very precious her grandparents were to her. 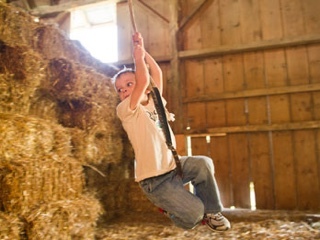 This past summer she shared multiple times the joy she felt running and jumping to climb the hay mow in the barn and that she even started to dream about it at night. She, like Paul from Philippians, knew what it was to be content in any situation...Mom often said that "she made up her mind" to have hope and a positive outlook. It was a decision she chose. It was not unusual for mom to respond to questions with "I am satisfied" and if pressed for more of an opinion I can just hear her answer, "no, really, I'm content...whatever is decided I am fine"". The actual definition of content is: satisfied with what one is or has; not wanting more or anything else. And she grasped it. In 1950 mom married a painter decorator who became a business owner, but she continued to make gardening and food prep a priority. She enjoyed the work of a garden. Each spring began her quest of who would she convince to rototill her garden and where could she find good fertilizer. To me she became oddly joyful at the prospect of some rich manure being dumped on her garden...she seemed to think she hit the lottery! I remember long hours spent at our truck patch over where the back entrance to the Souderton high school now sits. 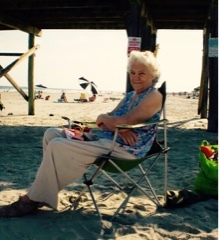 She loved to feed her family fresh food and get her basement shelves and freezer stocked. She accommodated my dad's hunting hobby with recipes for venison, rabbit and squirrel pie, which I despised just as much as oyster stew. And for the record, ketchup does NOT make everything taste better. Her love of homemaking makes sense though, when you consider how it allowed her to take food she saw as basically free and rich with fresh vitamins and provide for her family and friends as an act of love. My mom completely mourned the loss of gardening over the past few summers and eventually settled on tomato and squash planted outside her door...despite my complaints that I thought it looked tacky. The last few years she felt regretful that we cooked for her and she came "empty handed". Sometimes she still tried her hand at baking and ate half a cupcake just to insist someone come and fetch the rest. As recent as two weeks ago mom suggested we figure a way for her to get apples from "up on Washington avenue" with plans to make pink applesauce. My moms life changed dramatically when my dad passed away 6 years ago on September 12th, same day as her son and her grand daughter's birthdays...and now the date of her memorial service. As I hinted, the only thing mom ever spoke of with sadness was death. Despite her pride of earning, through a mail course, a nurse's diploma in her younger days, she didn't like seeing people sick or suffer and she deeply grieved losing those she cared for. She didn't like music or flowers that reminded her of funerals. She didn't like to talk about things of that nature. After dad died she missed things like going out for Saturday evening at a diner, road trips to Lancaster, and bus tours, but she fell into a new routine, thanks to her family, friends, and church. And again, thanks to her ability to be content at home reading her favorite devotional, cookbooks, baking, and watching her beloved Dr. Becker and other doctor programs. And while she felt the loss of my dad, and mentioned that to me just recently as we took a drive, she thoroughly delighted in hearing about the grandchildren. Growing up, our parents believed that expressing pride in us would encourage us to become prideful, a sin, so we went without hearing much about that. However, I am quite sure that they were proud of their 9 grandchildren. Mom loved to talk about their schooling, their work, their activities, their relationships. While it frustrated us that she was so opposed to having help come to assist her, thankfully, if a grand daughter offered to clean or cook or weed her eyes lit up! "I can do all things through Christ. He gives me the strength." So often we isolate this verse and we apply it to only encourage us to do the impossible....that we can do it all and have it all. In this age of the popular prosperity gospel of health and wealth, we need to recognize that the verse is in response to the unpopular fact that we WILL have times of need and want, followers of Christ or not. I like the fact that this verse is written in direct support of “I can be content in any situation.” When we talk about our mom- her growing up, raising a family, and health struggles-we often refer to her as an OVERCOMER. And while I believe mom was proud of you grandchildren for your school work, music abilities, teaching, church work, cooking, nurturing, and love for each other, I believe something else blessed her more. She watched you as you yourselves have been in times of need....she's prayed for your times of anxiety, Stihls disease, Klein Levine syndrome, cerebral palsy, crazy allergies, learning disabilities, and each and every rough patch. After years of her OWN ups and downs, I believe mom concluded that contentment is not based on your possessions, but on who possesses your heart, namely Jesus. I KNOW she was concerned and delighted for each of you to also choose Jesus to possess your heart and life, and that through Him and his salvation, you too are also overcomers. The best way to honor our mom, your mom mom, is to expect times of plenty and times of want, knowing you will Overcome through Christ who gives you the strength, and rest in his contentment. That, I believe, is her legacy for us.